Introducing the all new, Firefighter Pocket Multi-tool, the Tygh Tool, available now on our site! Created by a Philadelphia Firefighter, Dan Tygh, who wanted to solve a problem and make his job a little more effective-thus, the Tygh Tool was born. He wanted to make a product to keep his trips to and from the truck limited as it was wasting time on the scene. He wanted to make a tool that was small and versatile, but could be used for both routine and also less common firefighting tasks. He also wanted to combine tools for both engine and ladder work. 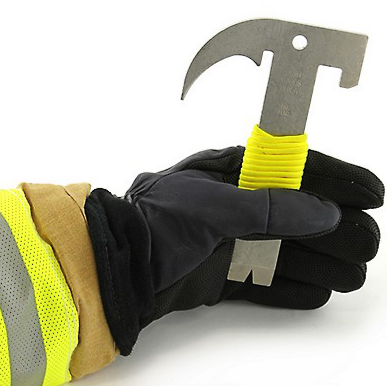 The Tygh Tool doesn't only function as a general tool, such as a hammer, wrench or pry bar, but it's tailored for firefighter needs by including the capabilities of a spanner wrench, gas shut-off, rope hose tool, door chock and much more! You might wonder how there can be over a dozen uses in one small tool-but it's true! In less than 1lb, and easy to fit in your pocket, made out of a single piece of stainless steel, the Tygh Tool WILL survive the hardships of any fire job and will quickly become the most useful tool in your gear. To see photos of the Tygh Tool in it's element performing it's featured uses, check out our website here.